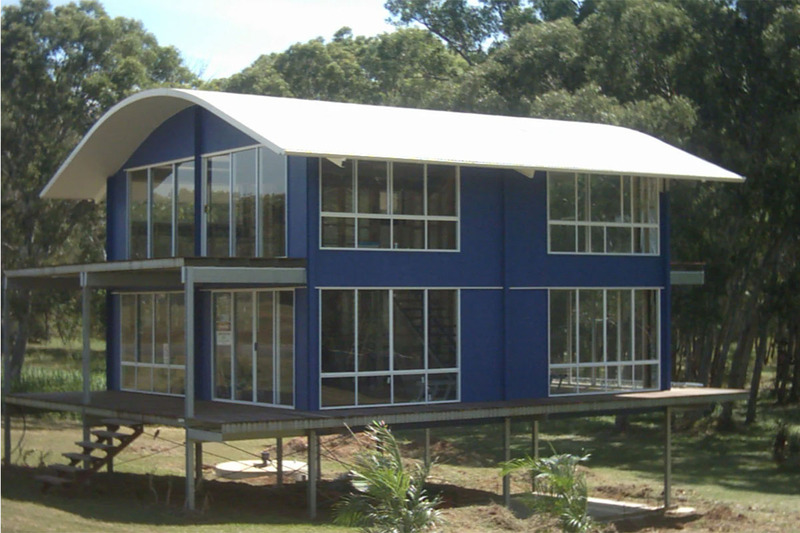 Fast and Easy - That's the Ezy Homes Advantage! From our deep consultative process, we individually draft your house plans. We draft and re-draft your plans until you are 100% happy (we don’t charge extra for re-drafts). Plans are submitted to your local council then, once plans are approved, a surveyor marks the pier footing locations on-site. 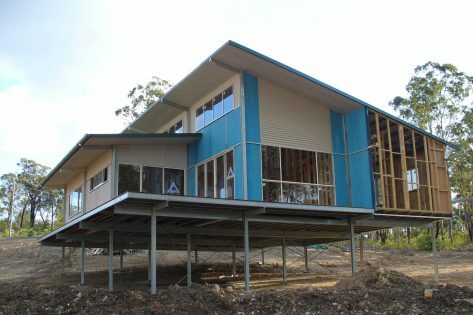 The footings are dug & poured in a single day – then the footing heights (RL’s) are recorded and provided to Ezy Homes. 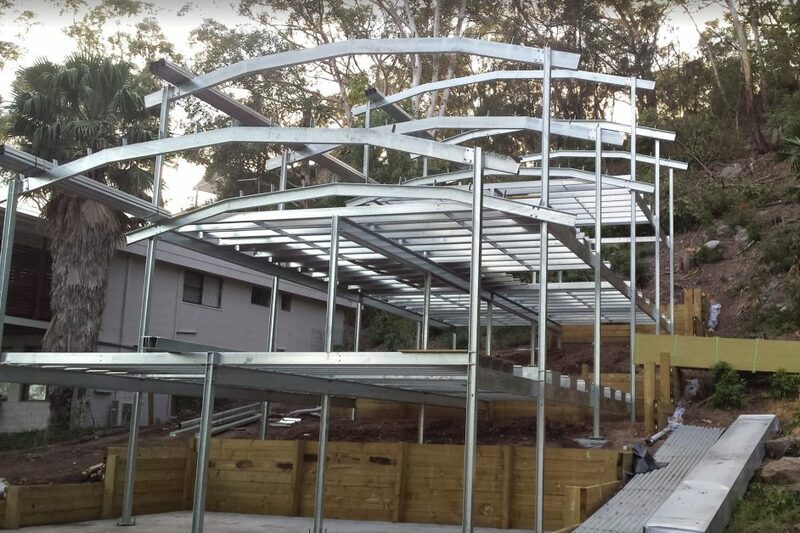 We then computer engineer and custom manufacture the building components to suit the levels of your site – so that everything simply bolts together on-site. 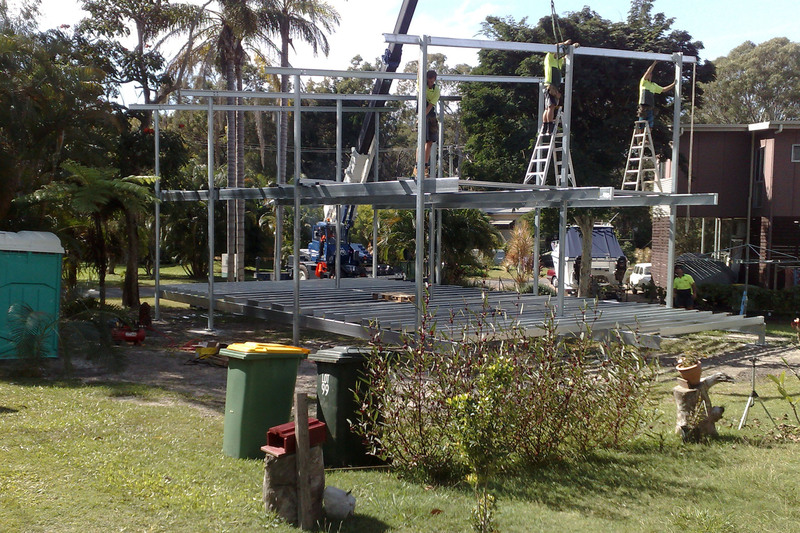 Your steel frame components are delivered to site 3-4 weeks after footings are poured. As shown below, an Ezy Homes frame kit can be erected in just 1 week – and built to lock-up stage generally in only 3-4 weeks, even on the most difficult building sites. 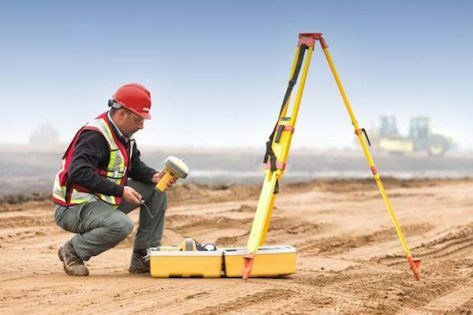 Your site is surveyed and the footings are poured. 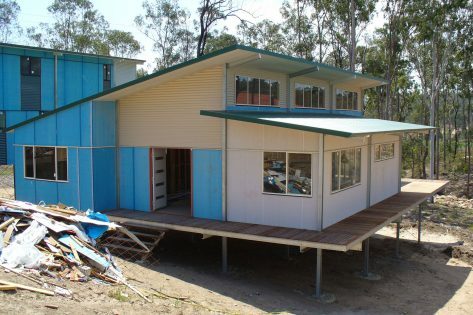 The house components can now be custom manufactured to suit your site – which takes about 4 weeks once footings have been poured. A crane is used to erect the entire steel frame in just 1 day. 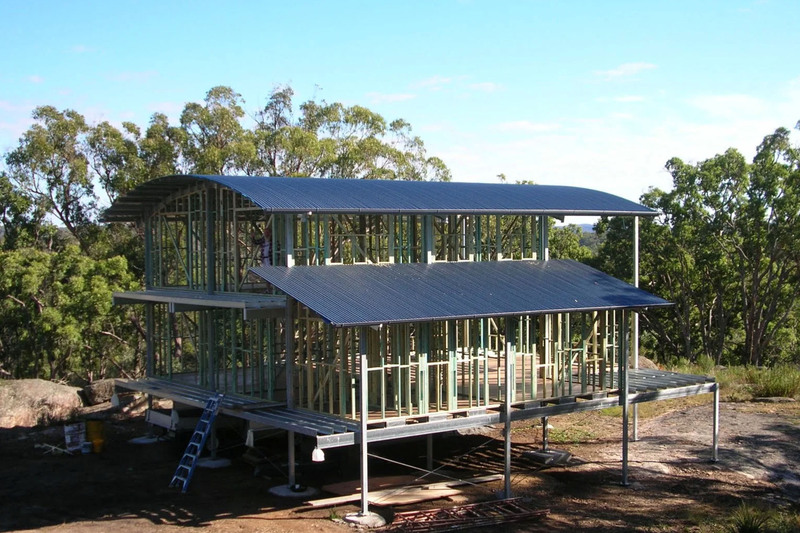 Because the frame is pre-engineered & pre-drilled, the components simply bolt together. 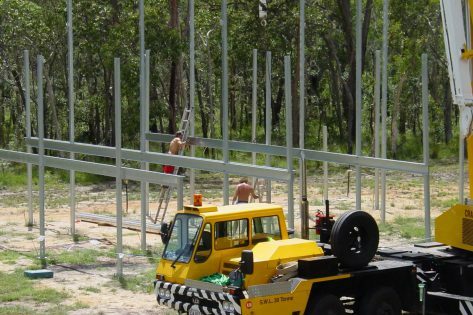 Using a crane is not always necessary, but it does make erection faster & easier. The flooring and hardwood decking are laid now, and any sub-floor bracing is installed. 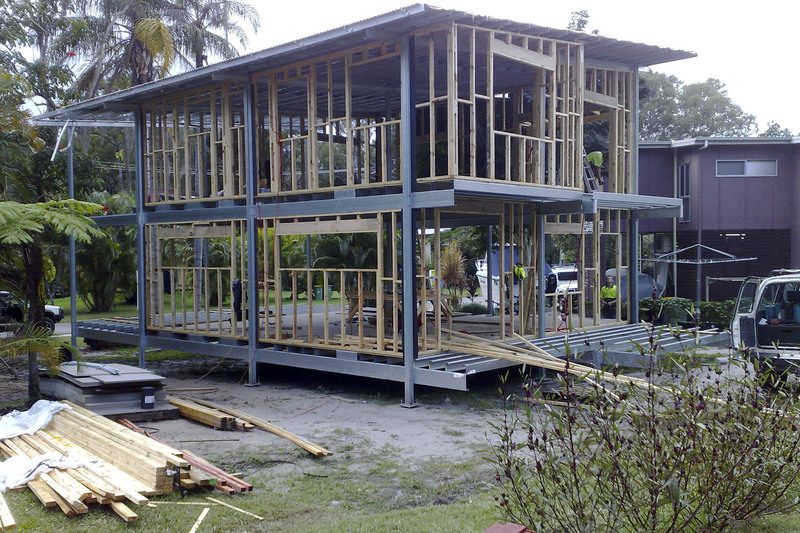 The roof frame is constructed, which also simply bolts together. 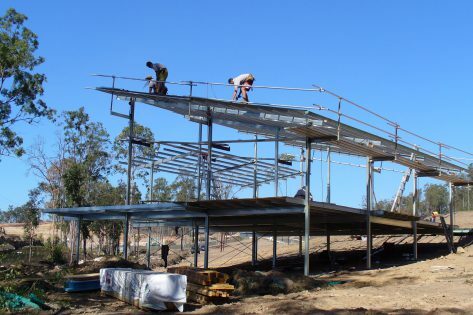 Your designs can use a truss roof or raking roof beams, depending on your climate & preferences. 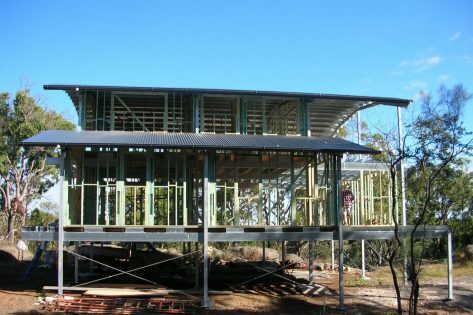 Roof sheeting, roof insulation, and gutters are installed once the roof frame is assembled. The frame kit has now been fully completed. The wall frames are built now. 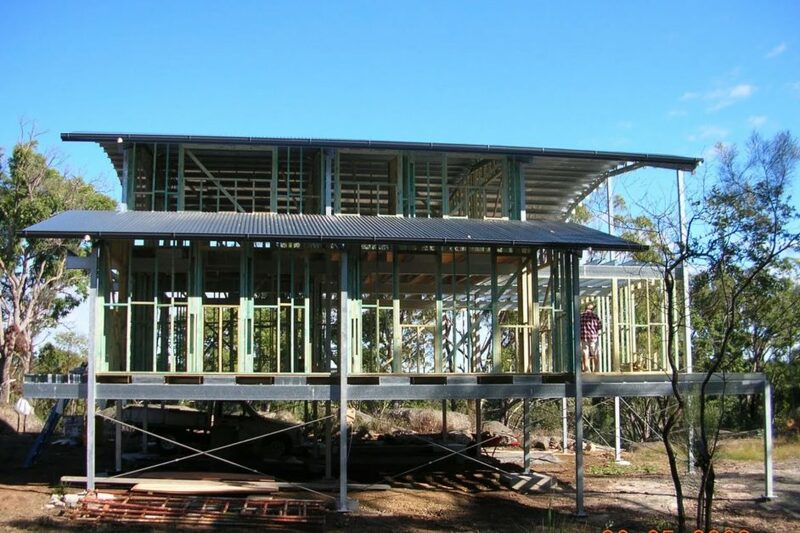 Timber is standard, steel wall frames are optional. The doors & windows are fitted and the building is wrapped in sarking – ready to cladd. 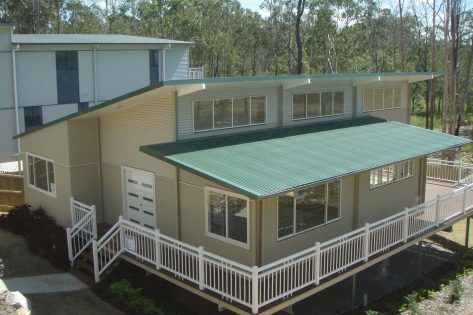 It’s your choice – Colorbond, Hardie sheet, weatherboards, rendered finish – or a combination of any cladding can be used. Use your imagination to create your own unique home. Now complete to lock-up stage, the home is ready for external finishing and internal fit-out. This is when your electrical & plumbing “rough-in” is done. Now the inside of the house really takes shape. 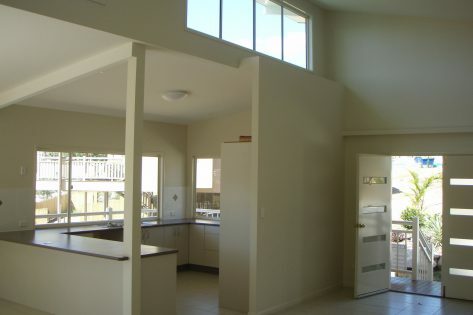 Flexible floor plans enable you to transform our plans into YOUR home. The finishing touches. Painting, balustrades, landscaping, and your personal touches. Here you can DIY many tasks and save $$.